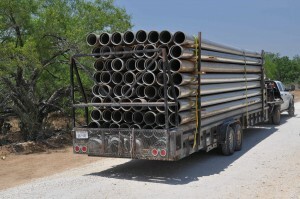 We had another slow day out here on the Briggs Ranch, we had the Mulching crew in and they said that one of their Machines was broke so they spend most of the day chasing parts and Oxygen for the torch to heat a bearing race up to try and get the busted bearing off. We also had the Survey Team back in , they are with the Global Geophyical Services and they are gps locating and placing steel pins and flags where the (as the called it the Big Footed shakie Truck) will run seismic tests to determine where oil is likely to be found and the mulching crew has cut trails all over this ranch and they now have a crew doing the same thing on the ranch next to this one. 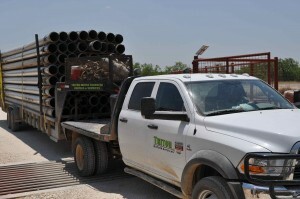 Here come the Triton water supply & Rental Co to finish the installation of Frac Pipes 2 miles of it. we found out tonight that our Frac has been delayed until the 5th of May so I guess that we will have a few more slow days before going at it.